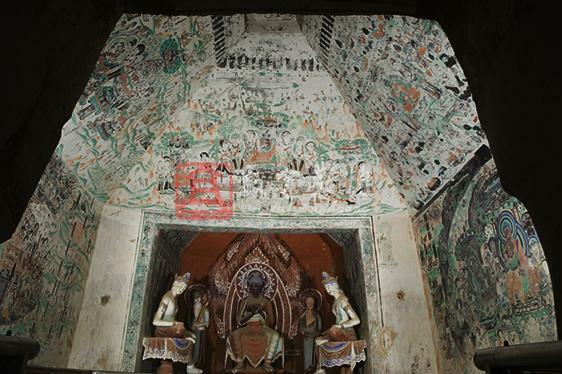 Located in the middle section of the Southern Area of Mogao, this cave was constructed in the High Tang and renovated in the Middle Tang and Five Dynasties. The main chamber has a truncated pyramidal ceiling with a large lotus pattern in the ceiling center. Four illustrations of the Maitreya sutra, the Universal Gate of the Avalokitesvara sutra, the Amitabha sutra and the Usnisa Vijaya Dharani Sutra are respectively painted on the west, south, north and east slopes. The west niche has a grouping of seven -stucco figures renovated in the Qing dynasty. The stories start on the north wall, then continue on the east wall and end on the south wall. All represent the episodes in the Lotus Sutra. The corridor has a flat ceiling, on which part of the illustration of Defeating Mara has survived. Those paintings of the Five Dynasties on the south wall of the corridor are about the god of the sun in uncertain Esoteric Buddhist scriptures, and the others are all damaged. Part of the thousand Buddha motifs of the Five Dynasties has survived on the ceiling of the front chamber. The space above the entrance wall is filled with draperies and Buddhas in meditation of the Five Dynasties (with a Tangut inscription). To the south side of the entrance is part of a heavenly king (most blurred). The space on the entrance door was originally filled with draperies, an apsara and a heavenly king of the Five Dynasties, and now almost all of them have been covered. The cell in the south wall of the front chamber is numbered cave 24. The north side of the entrance wall illustrates the Parables of the Magic City and Rejoicing the Merits. The opposite side depicts the magic events about the Medicine Bodhisattva and the Longevity of the Buddha. Focusing on the scene of "beholding the Pagoda of Prabhutaratna Buddha," various scenes of "emerging from under the earth" and "beholding the pagoda" are arranged around. In the center of the south wall is a large picture showing Sakyamuni and Prabhutaratna sitting side by side in the pagoda, and outside the pagoda are episodes of "the manifestations of all Buddhas coming to the assembly" and the fable of good doctors which illustrate the longevity of the Buddhas. The ceiling of the west niche is decorated medallion-shaped flowers arranged in rows of squares, and the four slopes show 13 standing Medicine Buddhas and five attendant bodhisattvas. Images of a heavenly king and three bodhisattvas (outlined in later times) have survived on the south wall, and a heavenly king and 2 bodhisattvas of the Middle Tang and outlined in later time survived on the north wall in the niche. The north side out of the niche has an image of Kistigabha in the upper and two bodhisattvas below (vague).There is an inscription left by the three brothers of the Li family who worked as sculptors in the Republic of China, which reads: "Made by the brothers Li Jiyuan, Li Chengguang, and Li Shaoguang from a small place in Longxi, 80 li away from the city." In the center of the north wall is a preaching scene, and around it are episodes from the Lotus sutra. Some of the scenes are vague and those identifiable ones include the illustrations of different chapers like the Introduction, Expedients, Fables, Predictions, and Emerging from the Underground. In the illustration of the Usnisa Vijaya Dharani Sutra, there is a large sized preaching scene in the center, in which the Buddha sits in Lotus position on a lotus throne. The splace of both sides and the lower part represent the disciples, bodhisattvas paying respect to or listening to Buddha's teaching. Above the preaching scene is an image of Mt Sumeru with buildings, which indicates the paradise where Indra and the other gods reside. However, there are no people in the picture but buildings and trees. Between the paradise and the preaching scene is a scene of Indra and his attendants descending on a cloud. below the preaching scene and on its either sides are scenes of espisodes from the Introduction of the Usnisa Vijaya Dharani Sutra. The episodes on the right side start from the bottom and then go upwards, including the scene of spreading soil on the skeletons and various wild animals including snakes, buffalos, and vultures. Those on the left side include the scenes of Shanzhu being freed from the reincarnations, Indra paying a visit to Sakyamuni, Sakyamuni predicting that Shanzhu would become a bodhisattva in the future, and the images of high buildings where Dharani sutra are kept, high mountains, pavilions, and people bowing toward the pogodas. The scenes below include those of hells, rebirth, and blind people led by other people. An illustration of the Chapter of the Universal Gate in the Lotus sutra mainly depicts Avalokitesvara in the center and scenes of Avalokitesvara rescuing people from trouble and the thirty-three menifestations of Avalokitesvara on either side. The Maitreya sutra illustration is divided into the upper part, which shows the preaching scene of Maitreya Bodhisattva in the Tusita Heaven, and the lower part, which focuses on the Three Assemblies of Maitreya, interlaced with various magic scenes when Maitreya was born in Ketsumati, including the shaving scene of the king Sankha with his sons and minister, the scenes of Maitreya visiting Kasyapa and Maitreya returning to the city. An illustration of the Amitabha sutra puts the Three Holy Ones in the center frame, and around the frame are 47 Bodhisattvas sitting on lotus thrones and listening to Amitabha Buddha's preaching, which are arranged into six rows. The stems of the lotus thrones are all connected with that of the Central Amitabha's. In the center of the ceiling is a lotus design. On the north wall, only the sun god image is preserved, which is from an unknown esoteric Buddhist scripture. Part of the illustration of Defeating Mara of the Five Dynasties is preserved on the top of the corridor. Draperies, an apsara and a heavenly king of the Five Dynasties in the space above the entrance on the west wall now have been covered.